Pete Souza, the former White House photographer under President Obama, has released "Shade: A Tale of Two Presidents," a book filled with archived pictures that may induce nostalgia. Although pictures may be worth a thousand words, in the Instagram age, it is often the contrast between the image depicted and the few words accompanying them that tell the real story. Pete Souza, the former White House photographer during the eight-year tenure of President Barack Obama, knows that all too well. The man who accompanied Obama around the world and maintained unprecedented access to the 44th president of the US — Souza claims he only missed one day of work due to illness during that time — has become a master at pairing image with text. Beginning on January 20, 2017, Souza shuttered his official Instagram account documenting life with the president and started an account in his own name to post archival images from his time with Obama. Complementing his selection of images were short sentences or brief phrases making allusions to political events under the new president of the US. Without ever referring to the sitting President by name (though he sometimes dubs him "46 minus one," a reference to Trump being 45th President), Souza has used the captions on his Instagram account to provide commentary about the current state of US politics. With his biting, subtle statements, he has been, in modern parlance, "throwing shade." In doing so, he's won over two million followers on the social media platform. And he's taken that art to a new medium, publishing two books of images from the more than two million photographs he shot of Obama during his time in office. The latest, Throwing Shade: A Tale of Two Presidents, released in the US on October 16, 2018, relies on the juxtaposition of pairing images with brief texts, newspaper headlines or even tweets by Donald Trump as captions highlighting the contrasts between the two presidents. 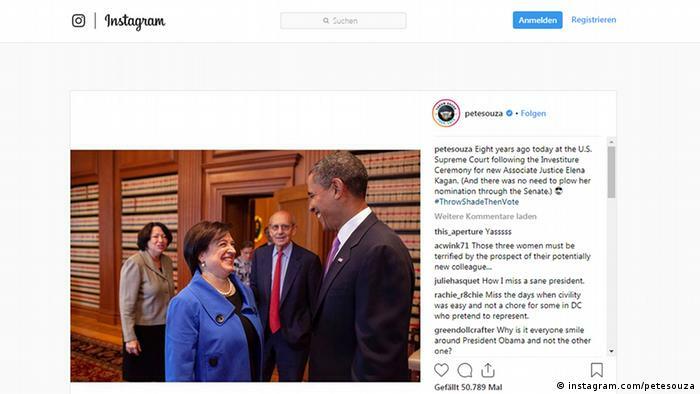 During the recent controversial confirmation hearing for Supreme Court justice Brett Kavanaugh, who had been accused of sexual misconduct, Souza posted an image of Obama meeting with his nominee for the same position, Elena Kagan. The caption read, in part, "And there was no need to plow her nomination through the Senate." He's also active on Twitter; his bio there reads "Citizen of the United States (COTUS)" and he frequently tweets about current political issues, including the upcoming midterm elections. After Kavanaugh was confirmed to the Supreme Court in spite of the allegations leveled against him, Souza tweeted a reminder to #VoteThemOut, referring to the Republican members of Congress who had confirmed the judge and who are up for re-election in November. The photographer, who also served as official photographer during the Reagan Administration and worked as a freelancer documenting the Kosovo refugee crisis in the 1990s, as well as the US invasion of Afghanistan and fall of Kabul in late 2001, likewise recently opened an exhibition of his work in New York called #ThrowShadeThenVote. Although some might believe he supports a particular line of political thinking, Souza is cautious in interviews. According to The New Yorker, after one woman told him, "I love what you're doing to Trump on Instagram," he replied, "I don't know what you're talking about." Instead of toeing a particular party line, Souza has instead written that he is rather concerned for "the future of democracy." "I can't tell you how proud I am to have seen that there are actually a lot of people trying to do good. I was a photographer in the Reagan administration, and I would say the same thing about them," he said in an interview with the New York Times Magazine. While the photographer has published several books collecting his images of Obama, he has likewise released two collections of his time working with the Reagan Administration, among other books. Yet even before its release, Shade: A Tale of Two Presidents looks as though it will be the book to storm the best-seller charts. That may be the result of the award-winning photographer's loyal social media following. Or the witty format the book takes in which the words say as much as the picture does — and create an entirely new narrative. After learning that Senator Collins had voted to confirm Kavanaugh, Souza posted this image, with the caption, "2020 is in two years. #ThrowShadeThenVote"
Still, the juxtaposition of the two presidents also sets readers of the book up for a heavy dose of nostalgia, a feeling that is as misleading as it is necessary. As Dr. Neel Burton, author of Heaven and Hell: The Psychology of Emotions, has written, some would argue that nostalgia can distort and idealize the past. "The Romans had a tag for the phenomenon that psychologists have come to call 'rosy retrospection': memoria praeteritorum bonorum, 'the past is always well remembered,'" he writes. While the Obama of the book's cover is adorned not in rose-colored glasses but in red-white-and-blue slatted sunglasses — literal shades — readers may feel drawn to the book out of a longing for the past presidency as an aesthetic dream. Nostalgia does, however, has its uses. In one study on personality and social psychology released in 2013, researchers determined that nostalgia can create a sense of optimism about the future, in part because people feel more connected to others socially. If Souza does, as he says, fear for the future of democracy, perhaps the connections created by his social media platforms and this book can create connections — and along with it, much-needed optimism.